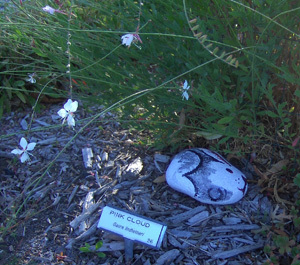 It’s not completely out of the question to find a rabbit in the Riverfront Park Xeriscape Garden. But an elephant? And a jellyfish? 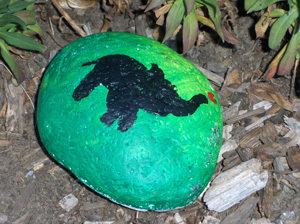 Master Gardener Terry Anderson has spied all three — painted on rocks. An anonymous artist placed the paintings in the garden, he said, to the delight of volunteer gardeners and people passing by. 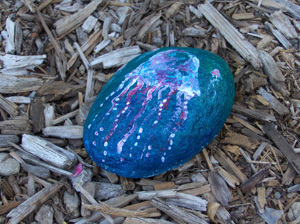 the location of two more brightly painted rocks that Anderson hadn’t noticed. The artist is the daughter of one of the women, who said the secretive placement is related to a community suicide prevention project. And that’s all she wanted to reveal. “She said, ‘Is that OK?’ and I said, ‘Yes, of course, and let your daughter know they’re much appreciated,’ ” Anderson said. The garden has been vandalized in the past, with people pulling up, tromping on or stealing plant-marker stakes. But so far vandals have left the rocks alone. The garden itself is a work of art this time of year. “The cooler weather has brought on a new flourish, with lots of things in bloom,” including a beautiful coppery rose plant called Autumn Joy, Anderson said. “It’s the most gratifying place I’ve ever volunteered to do something. My co-workers, the Master Gardeners, are just blown away by how many people stop by” to thank them and to share that they’ve incorporated Xeriscape into their own landscapes. The garden is located along the Apple Capital Loop Trail, near the Nile Saunders Steam Train (map). It’s maintained by WSU Extension Chelan-Douglas County Master Gardeners as a showcase for low-water-use plants and grasses. Chelan County PUD promotes Xeriscape as a water conservation tool and is a garden co-sponsor. View the garden’s many varieties and learn more about Xeriscape on the PUD website. Seattle architect Brett Holverstott has updated his blog with photos showing the progress of the passive design house being built on Lake Chelan. 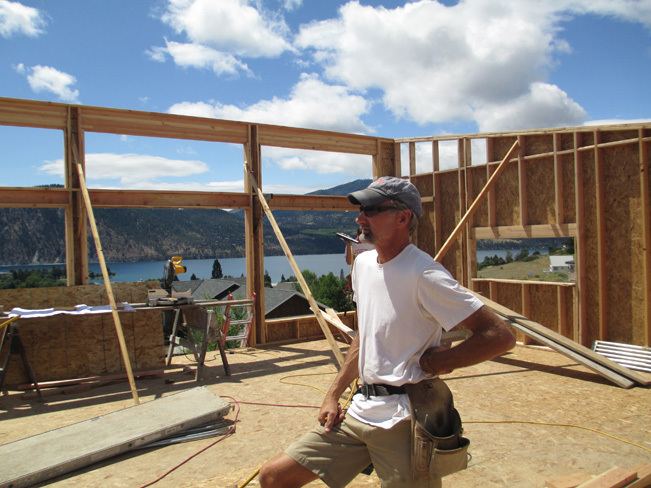 Builder Mike Schramm takes a break during construction of the passive-design home on Lake Chelan. The photos document some of the extra measures being taken to tightly seal the home using extra caulking, tape and dense-pack cellulose insulation. The south-facing home on the lake’s north shore will incorporate super-insulated floors, walls, and roof; air-tight enclosure; high performance windows primarily oriented to the south; and a heat recovery ventilator (HRV) which uses the outgoing air to precondition the incoming air. The home will not need a furnace. A passive home can consume 85 percent less heating/cooling energy than a typical home. Brothers Mike and Mark Schramm of Green Gables Construction, Chelan, are the builders. The home is owned by Rick and Jacque Hyler of Renton, who will move to it permanently after retirement. View updates on Holverstott’s blog from July 24 and July 4. Read the original story about Holverstott and the passive design home here. When you think of skiing or snowboarding you think snow, right? But at Stevens Pass Mountain Resort they’re thinking sun. As in solar, and solar power. The resort installed a small solar system at the top of its Skyline Chairlift that should generate electricity most of the year, said John Meriwether, manager of Environmental Sustainability. Stevens Pass Mountain Resort has added a solar system along the Skyline Chairlift and expects to churn out sun power up to 10 months of the year. The installation was delayed by a year when the Tumwater, Wash. engineering firm hired for the project declared bankruptcy. 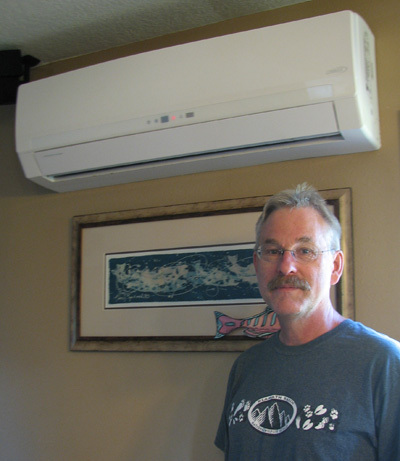 A Seattle contractor was called in to take over, and the installation was connected to Chelan PUD’s grid on July 10. The resort is now part of the PUD’s customer-based SNAP program. A $5,000 grant from the National Ski Area Association helped Stevens Pass pay for the project. More solar is planned. 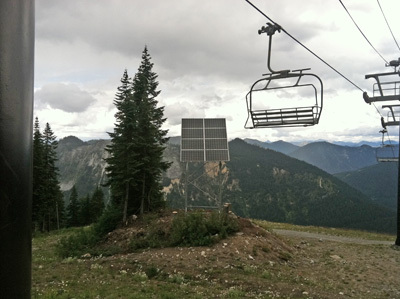 “Chairlifts have lift stations that need maintenance and upgrading, and once they come around in our maintenance rotation, we’ll plug a solar component into that,” Meriwether said. Prime south-facing locations include the Double Diamond chairlift and the spot where the Jupiter and Tyemill lifts come together. Stevens Pass has won several regional and national environmental honors, including the National Ski Area Association’s Golden Eagle Award for environmental excellence in 2012. The resort has an aggressive sustainability program, Meriwether said, that takes in recycling, composting and energy and water conservation. A facilities audit conducted a few years ago resulted in a road map for the resort to make efficiency improvements “and we’ve been clicking away at those projects,” he said. Upgrades made at its three lodges include insulating doors, adding occupancy sensors for lighting, sealing elevator shafts against heat loss and installing low-flow toilets. Resort staff also helped bring an electric vehicle charging station to Stevens Pass. A former staff member on that project, Ross Freeman, is now the sustainability manager for the city of Mercer Island, where a “solarize” campaign is under way with Northwest SEED.